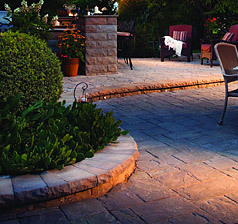 A Superior Pavers Inc. has been in business since 2000 and takes great pride in the relationships we have built over the years. Our experience can be noted by the successful installation of over 1,000,000 square feet of pavers. The continued loyalty of general contractors, homeowners and manufacturers is a clear indication of our high-standards, honesty and dedication. A Superior Pavers Inc. holds certifications with the Interlocking Concrete Paving Institute (ICPI) for interlocking segmental pavers, permeable interlocking concrete pavers (PICP) and segmental retaining wall installations. We are fully licensed and insured. What does this all mean to you? You can be confident that you have chosen a professional and qualified contractor. We look forward to exceeding your expectations by providing you with a positive experience through the duration of you project. Thank you for visiting our website. If you have any questions or concerns, please do not hesitate to contact us. We welcome the opportunity to speak with you about how we can make your hardscape dreams a reality.